Like the famed Lockheed SR-71, Blackbyrd has been decommissioned (you may not have heard -- it was all sort of under the radar). Thankfully, the ESL guys have replaced all those metal grates and steel pipes with Hanoi House, a Vietnamese noodle shop that's all sultry reds and blacks, so try to slurp as sexily as possible. 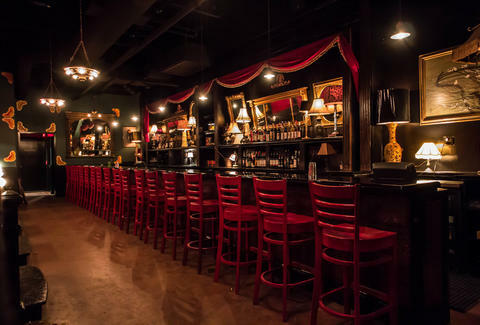 There's a burlesque touch here (note: burlesque touching is generally illegal, don't try it yourself): antique gold mirrors; long, draped dark red curtains over the bar and windows. Plus, a wall-mounted ladies' dressing screen that'll ironically be ogling you as you house steaming bowls of pho with chicken, brisket, and round eye (the beef, not what the cooks call you out back), as well as vermicelli rice noodle bowls with char-grilled shrimp, all overseen by the exec chef's Vietnamese grandmother. And there are other specialties like green papaya salad w/ beef jerky & spicy soy dressing, and a crisp rice flour crepe with shrimp & bean sprouts, all of which go for just about $11, or as they would somehow say in Vietnam with a straight face: 250,000 dongs. Their neighbors at the Gibson have also designed 'em craft cocktails, highlighted by a tea-based number spiced up with tamarind/ vanilla/ ginger/ El Dorado and the tiki-ish mango puree/ pineapple/ Pisco joint. Or you could just go in and wing it.